The FLOUT® Family of Siphon Alternatives. 1, 2, and 3 inch FLOUT® Floating Outlets designed to automatically quickly flush a tank after the level reaches the desired height no matter how slow the inflow might be. As long as the inflow to the tank/bed is slower than the max flow out of the FLOUT® and through the pipes, the FLOUT® will drain the tank no matter how slow the inflow is. Far more clock work than siphons. Can be used to replace the siphon/bottle flapper valve of a barrel system (no more fishing leaders to break or bottles to clog or flappers to break.) 1″ FLOUT® can be installed directly in grow beds to flood and drain constant inflow beds. 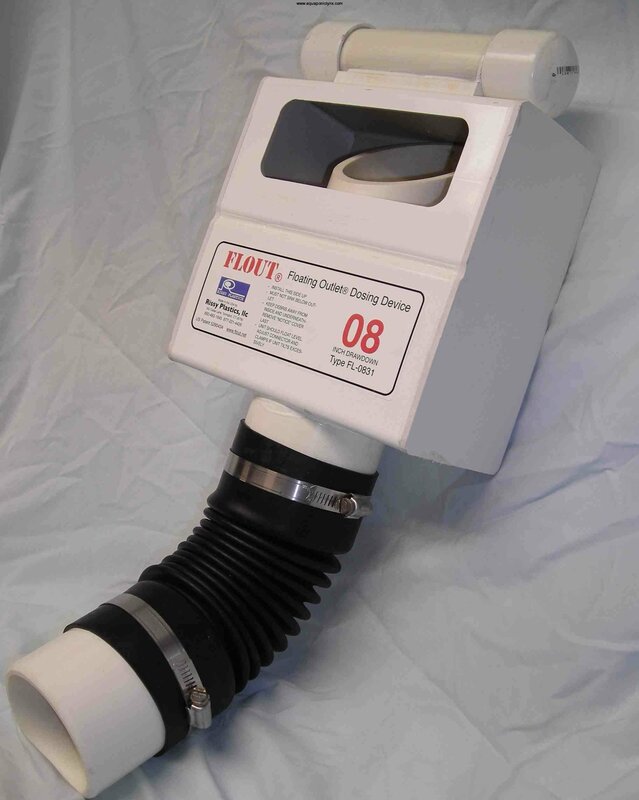 2″ FLOUT® makes a perfect flush tank valve. 3″ FLOUT® is probably a bit large for most average Aquaponics applications but may be appropriate to drain a combined bank of grow beds automatically or for some other specialized applications. The improved 1inch outlet delivers 7 gpm from drawdowns starting at 3 inches. Currently FLOUT® ships by USPS though we are looking at UPS as well so make sure your paypal address can handle either one, or leave me notes about shipping when you check out. With the 1 inch FLOUT® starting at $60 it is priced to compete with more problematic siphon kits. The FLOUT® does take a little more space in a grow bed but it will be far more reliable. Especially if you are cutting it a little close on heights to get enough fall to let the siphons work easy. As long as the water gets to drain to the bottom of the grow bed, the FLOUT® will re-float. No, sorry the FLOUT® still won’t make water go up hill. The new 2 inch outlet delivers 28 gpm or more from drawdowns as low as 4 inches. A good option for flush tanks or large deeper grow beds or for doing fast flood of grow beds and allowing them to drain more slowly. I think the 2″ FLOUT® are going to be very useful for many applications in aquaponics and I’m so excited to finally get to offer them. I’ve been waiting for over a year to start selling these. The Original 3 inch FLOUT®. NOT to be installed in the fish tank without a cage to protect small fish from being sucked away!!! Well, installing a FLOUT® in a fish tank would require a shelf to keep the FLOUT® from dropping past horizontal so not really recommended anyway. The original three inch outlet delivers 65 gpm or more from drawdowns as low as six inches. The three inch FLOUT® are big. They will release a deluge of water that if directed into a gravel bed will really shift the gravel. These are not designed for flooding a 50 gallon tank or two they are for emptying a large tank fast. Like for dosing a leach field. Or perhaps sending the gray water out to the mulch pits or perhaps if the header tank is up high enough, they might even be of use for driving a gravity modified indexing valve, but this is definitely an advanced application and we need to talk if that is what you want to try since there are specifics to making it all work right. Video of a 3″ FLOUT® in action. The FLOUT® Family is the newest addition to the Aquaponic Lynx product list. Please welcome our new family. 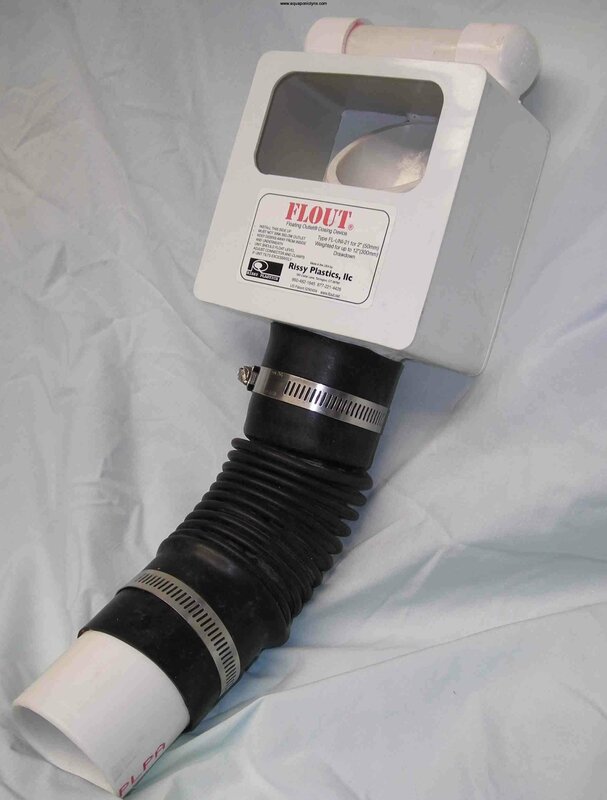 FLOUT® were originally developed to solve siphon problems in septic system drain field dosing. This is where the large FLOUT® come from. Last spring I was attempting to use a 3″ FLOUT® to feed a gravity modified aquaponics indexing valve after my automatic low pressure valve electronics got a bug. Unfortunately my set up didn’t quite have the height I needed to make it work. For more on that topic please see the blog post. A siphon won’t operate an indexing valve (at least not without a huge amount of height to work with) but I still have hopes that I might some day manage an indexing valve with a FLOUT®. As a siphon alternative they are great and there will also be a FLOUT HOUSE gravel guard available for them soon too. That’s going out the (round) side via a 3-inch Uniseal, I take it? I think the 100-gallon RMST makes a lovely FLOUT chamber. And no vent. It seems to drain juust fiine without a vent. I was planning to provision a vent for my 3-incher, but after a few hundred fills ‘n’ drains, I don’t see the need to put one in. We’re not talking traditional septic application here. Count this as Sminfiddle’s endorsement of TC’s FLOUT offerings. Bear in mind, an easily obtainable plumbing fitting will split that um, EMPHATIC 3-inch flow into 2 x 2-inch equal flows going opposite directions. This is the one time you can split up a “gravity” or “siphon” flow and count on equality. These things don’t dribble! Yes I am plumbing it out the Round Side of the 100 gallon Rubbermaid Stock tank. I actually plumbed it out near the bottom too which was really a bad idea since there isn’t actually enough space to plumb a 3″ uniseal and I had to get really tricky to make it work. So beware that. But I don’t see it being all that likely for many people to plumb a 3″ Flout in such a fashion since a 2 inch FLOUT is likely to provide plenty of flow for most applications. As you said above, a 3″ is really effective though if you’re draining a whole bank of tanks. I like to plan big! If you have the extra 5 to 8 inches to raise the FLOUT tank up, ’cause like all plumbing you’ll want access, a hole can be cut in the flat bottom for a good ol’ shower drain or even a “water closet flange.” Add an elbow inside (to mount the FLOUT sleeve horizontally) and one below (unless it’s right over where you want the flood to WHOOSH, like a sump tank). You can still get about 18″ drawdown. AKA a fill about two inches from the top! And I still don’t see any need to worry about venting these puppies. Hi, thank you for your sharing your knowledge! I was wondering, would one flout be able to work with a large grow bed (16x4x 1 ft). I have been trying to figure out what size piping for bell siphons to use, and was considering breaking the bed into at least two smaller beds, but i’d like to go as simple as possible. From what I’ve read, these are far less dependent on flow rates and very reliable. The fish tank is 400 gallons, gravity feeding to the gb, to the sump, with the pump in the sump. The sump can either be 300 or 600 gallons. Two tanks can be joined. The reason for this configuration has to do with the lay of the land, and the existing structures. I am somewhat flexible on the grow bed width, and was considering 3 feet. There is room for another row of gb of the same size. The pump I am hoping will work is a 1585GPH. The head height will cut that down a bit, but I think I can get close to 1000 gal/hour. i______gb_________i i i This drawing shows the general idea. excuse my rambling. First to know how much flow you will have from your pump at height, look for a pump cure or chart from the manufacturer. You can’t really assume from the nominal gph how much the pump will move at a height (other than LESS) since some pumps are designed to move lots of water at very minimal pressures but their performance drops off drastically at relatively low heads while other pumps are designed to pump more water higher. Remember there is also losses due to the pipe and fittings as well as the head. Now if you intend all the water from your pump to go to the fish tank and then to flow through your grow bed, you may have some issues with making sure the plumbing from your fish tank into the grow bed doesn’t restrict the flow and cause your fish tank to overflow, remember the gravity flow plumbing generally needs to be much larger than the pumped plumbing. Also, a single grow bed may have issues with solids build up especially if the water is mostly entering the bed in a single location. You may want to consider 1, having a bypass on the pump so you can spray some of the water back into the sump if the flow through the fish tank is too much. 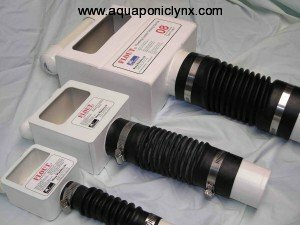 2, It may be worth considering having a bit of filtration set up after the fish tank to reduce the amount of solids that may be getting sent to a single spot in a single grow bed and also to allow you to send some of the water directly back to the sump without having to go through a grow bed since 1000 gallons per hour is probably too much water to flow through any single bed. For the FLOUT to operate, it takes a bit of space with out gravel in it so installing them in a bed is going to reduce the amount of space you can use. Also, they can’t drain a container all the way down so if you want the bed to drain almost all the way down you likely need to install the FLOUT in a container that is a little deeper than the bed you are trying to drain. 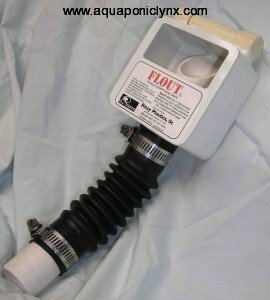 I have used a 1″ flout in a 4′ x 8′ x 1′ bed before and it worked great but I was able to adjust the flow rate into the bed and I was OK with the bottom couple inches not draining out. For a flow rate of 1000 gph, I will have to check but I suspect you will need at least a 2″ if not a larger FLOUT to operate at that rate And that would take up a fair bit of space to operate and I would say most definitely need a separate container to operate next to the bed. While it may sound simpler to make the system more simple, it can actually be rather complex to get things perfectly balanced. Thanks for such a fast response. According to the mfg. head chart, the pump should move around 530 gallons per hour at a height of 4.5 feet. I would be at 3.5-4 feet ideally, which puts it at about 594 gph according to the graph. I was planning on using 2″ plumbing for the gravity feed to the grow beds. Between the gb and the ft, i want to include a radial flow filter of sorts. I like the idea of the bypass to spray into the sump, with a ball valve I assume, for adjustment. I could break the bed/ beds into two 4×8 beds each. and would ultimately like to have either two long beds or four 4×8 beds. The external container is like the one in the video? Can you explain that setup please? The Video is just testing a 3″ flout. It was not set up as a Drain on a bed. I would need to make some drawings to really show how you might use a chamber to drain beds. Don’t have time At the moment though. No problem. I will keep trying to find an example of the flout in action to understand, they are few and far between on the web. I am a visual learner though. Thanks for all of the input, it is much appreciated. You are truly a valuable resource! And, I still am considering buying one, I just want to understand a bit more.